This summer has just flown by and I can’t believe it is the middle of July. The kids go back to school in 5 short weeks! 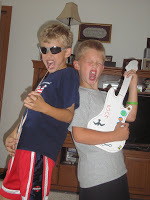 I have been so busy with other commitments this summer that the kids and I haven’t really had a day of fun together. So, today, I cancelled something else I was supposed to do and we spent the day at home…sleeping in, playing games, talking a walk, and doing a craft. I got these great guitar cut-outs from Oriental Trading. 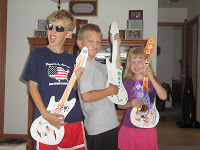 So, the kids each decorated their own guitar and then, of course, ROCKED OUT!